The coypu is one such animal that aptly defines the expression of ‘a boon and a bane’. 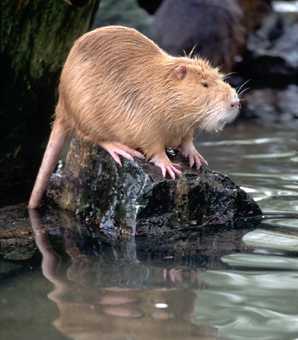 These semi-aquatic rodents are moderately big for their description of river rats. Originally it was South America that was home to the coypus. In the late 1940s coypus were introduced to the British Isles to be farmed. These animals have made a mark in the fur industry owing to their rich and soft inner furry coat. In fact this was the very reason that had lead to the exploitation of these animals in the fur trade. However, soon these animals surfaced their true invasive nature by destroying thousands of acres of marshlands. Today these animals are still significant for their fur, but are more so considered as pest and invasive species throughout their range. These herbivores are also referred to as ‘nutrias’ in North America and Asia. They dig burrows that are usually found alongside river stretches. 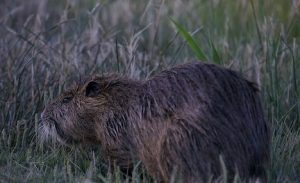 In appearance, the coypu more or less resembles a giant rat with a distinguished long and round tail and thick brown fur. The animal’s tail is not only thick but is also prominently scaly. Many a times the coypu has been referred to as a larger version of the Muskrat or Brown Rat. Size: The coypu is smaller than a beaver, but definitely bigger compared to the Muskrat. These animals become approximately 40-60 cm or 16-24 inches long, on reaching the adult size. Females are slightly smaller than the males. Weight: Their weight is around 5-9 kilograms when fully grown. Females weigh about 1 kilogram less than the males. Colour: These rodents are covered with thick brownish outer fur. The four large orange incisors, located in the front of this animal’s mouth are also very distinct, especially in the act of feeding. Distinguished features: The eyes, ears as well as the nostrils of the animal are situated at the high, upper end of its head. Moreover the webbed hind feet of this creature that attributes an overall hunched figure to it setting it apart from other rats. The hind feet comprises of 5 digits, out of which 4 are apparently webbed. Its front paws are not webbed as such. There are a total of 5 digits in each of the front paws. Coypus can be easily identified by the whitish patch in the forepart of its mouth. The hind legs are apparently longer compared to the front legs. One way in which females can be distinguished from the males, is the prominent mammary glands of the female that is situated in the upper portion of its flanks. This particular adaptation of the female’s body allows the animal to feed the young, even while it is partly submerged in water. It is the inner fur of this animal that is argued to be extremely soft and as such highly sought after. In fact it is this under fur, more popularly referred to as the ‘nutria’ that lead to the commercial exploitation of this animal. The coypu’s fur holds outstanding value in the fur trade. This clearly explains why these animals are bred in so many countries of the world. 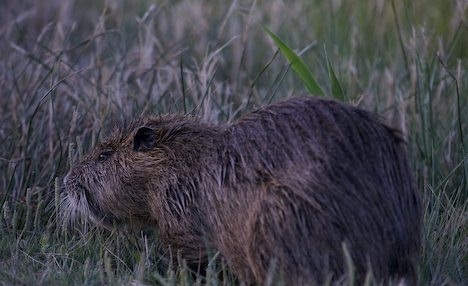 The coypu is a strict herbivore. As such its diet wholly comprises of plant leaves, stems, grains, plant roots and barks. They love to feed on fresh water plants of all kinds. These nutrias have also been spotted on river waste many a times. It has been observed that the animals gnaws and chews its food down. This particular characteristic is associated with its attempt to wear down the two front teeth. Similar to all rodents, the two front teeth continues to grow constantly till the end of the animal’s life. These animals can adjust and prefer to a variety of habitats that may include deciduous forests, scrub forest as well as rain forests. Most of the natural along with man- made waterways with ready accession are home to these animals. More often the site of the waterway is surrounded by the kind of vegetation preferred by the coypu. Nutrias dig burrows for shelter. Their burrows are usually made in soak-dykes or ditches, located behind raised river banks. These burrows can expand for 5 meters or sometimes even more in certain cases. It has been observed that the entrance of the burrow is generally at river level. However there could be several exits to a burrow; one exit could lead to the land while others would normally lead to water, owing to the semi-aquatic nature of these animals. Any natural or man-made waterway with ready access and sufficient vegetation can turn out to be an ideal site for coypus to dig their burrows. 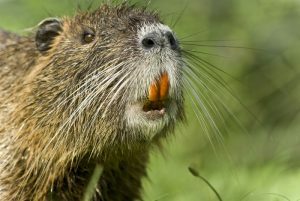 The taxonomy of the coypu dates back to the late 1782, when Juan Ignacio Molina had associated the animal to the mouse genus and described it as Mus coypus. After a decade, in 1792 another biologist Robert Kerr came up with the concept of ‘mouse-beaver’. As such Kerr derived the terms mys and kastor from the Greek. 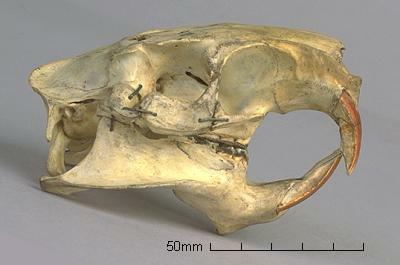 However, it was Geoffrey who coined the name Myopotamus coypus for the animal. Nutrias are often referred to by this term even till date. Amidst these four subspecies, the occurrence and introduction of M. c. bonariensis has been wide spread in other continents as well. This subspecies, is highly common to the subtropical portions of the animal’s range. These animals are found in regions of South America, North America, Europe and Africa. Coypus are extremely vulnerable to cold climates. As such their range is affected by the extent or severity of the winter of the specific place. Seasonal migration can sometimes be a trait associated with these animals. Due to the cold weather, they fall victims to frostbite on their tails. These frostbites are so severe that it could even be responsible for the death of these animals. In 1980 a significant decrease in the population of these species was recorded during the winter months of the Scandinavian continents and US states like Montana and Idaho. These animals begin to migrate northward with the arrival of winter. However it is important to remember that coypus were never native to the United States of America. In fact these animals were brought to the state of Louisiana from elsewhere to get raised for their expensive fur. Coypus are also significantly found in the region of East Anglia, Britain. There are very rare scenarios when these animals have been observed to be aggressive. On the contrary coypus are shy animals that run to hide into their burrows even when disturbed slightly. It is during the night and early dawn that these animals are most active. As such coypus come under the category of crepuscular animals. Coypus can live both in land and water which makes them semi-aquatic by nature. These animals are great swimmers and are capable of remaining submerged under water for a time period of over ten minutes. The breeding of these animals occur all year round. The female nutria gives birth to young ones. Their gestation period can extend to a time period of four and a half months. Each litter will consist of 4-6 newborns. Coypus are fully grown at birth. They have teeth and hair on their body, at the time of birth. Their eyes are open attributed with sight soon after coming out of the mother’s womb. These newborns are capable of moving around, after hardly a couple of hours followed by their birth. They reach maturity after a time period of 6 months. Females, breast feed the young. An adult female coypu is capable of producing 2 to 3 litters annually. Adult coypus face a great threat from human beings who exploit these animals for their fur. Other predators include weasels, foxes, dogs, stoats, owls, hawks and herons. The average lifespan of the coypu or nutria is 6 years in totality. However there have been cases wherein in captivity these animals have lived up to 10 years. Despite of their invasive nature, the nutrias are interesting species to study. These animals were responsible for creating a huge turmoil during 1940, in the Chesapeake Bay region situated in Maryland. Invasive coypus were known to have destroyed approximately 7000 to 8000 acres of marshland home to the Blackwater National Wildlife Refuge. A multi-million dollar eradication program was summoned in 2003, as a necessary act to counteract the invasive nature of these animals. Coypus are the sole living members of the family of Myocastoridae. These animals are home to temperate regions of South America. These animals carry a certain parasite in their body that can cause “nutria itch” in human beings. This condition is recognized by severe skin infection or dermatitis which is quite similar to strongyloidiasis. The mammary glands of female coypus are usually located on the higher part of their flanks. This enables them to feed the young, simultaneously while the lower part of their body is submerged in water. Herbivores in nature, they feed on water plants. They prefer to dwell in burrows that are usually located alongside rivers and water bodies. Coypus can be identified as a bigger version of the Brown rat or Muskrat. These animals have been exploited for a long time in the fur industry, for their soft and valuable inner –fur or nutria. These animals were brought to the regions of Europe, North America, Africa and Asia over the years, by people involved in the fur trade. These animals are referred to as ‘ragondin’ in France. Coypus are excellent swimmers. They can adapt themselves in both land as well as water. In countries like Germany, coypu meat is considered to a healthy alternative to other meat owing to the low cholesterol content. The meat of this animal is also sold and consumed in some Eastern Asian countries including Kyrgyzstan. These animals are not classified as endangered species. The World Conservation Union (IUCN) does not enlist this animal to be threatened. However the eradication programs set up against these species for their invasive nature, in countries like United States, Japan and France are likely to affect their population in these particular areas. A very informative article. I was once asked by graduate students if these rodents are indigenous in Kenya and this was abait challenging. So far i have known that they are introduced species. Congrats to the authors.